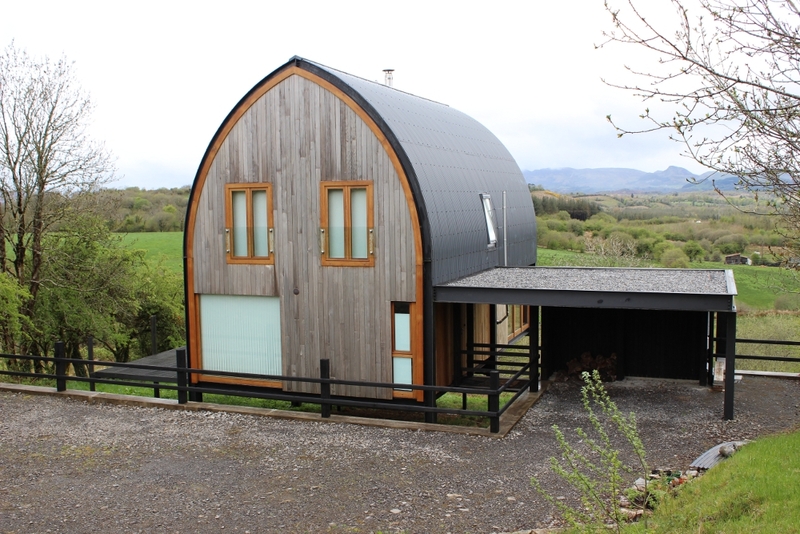 GOTHIC ROOFED HOUSE | Mathieu & Mitchell Ltd.
Frank Clintons plan to capture breath taking views of Ben Bulben and the surrounding countryside in his unique new home 20 metres long and 8 metres wide looked pretty straight forward. Building it within the required budget was the complicated part. 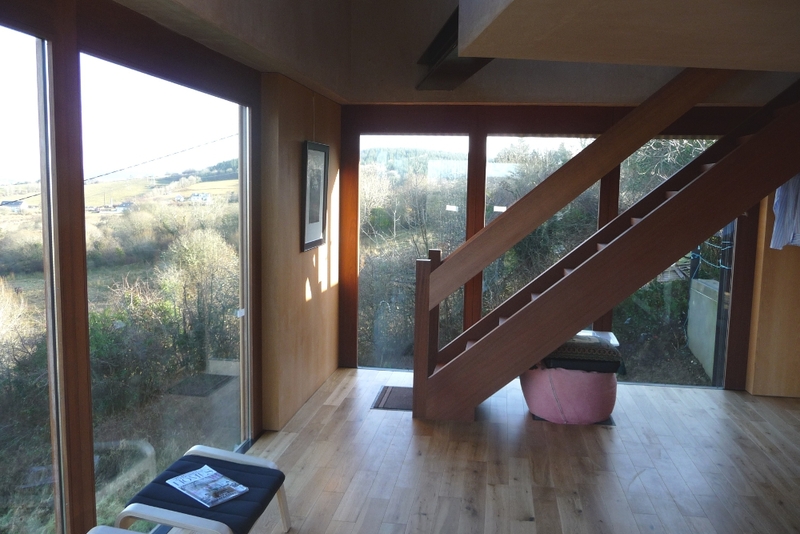 The design comprised of a light filled, open plan, ground floor living space, while the bedrooms were located in the roof space. Two unique elements of the design were the stilt supports and the Gothic style roof structure. Having been involved in the design project from the beginning M&M were able to inform the client as to what would and would not work within the budget constraints. While the stilt design was unconventional it had its benefits. As the site was sloping away from the road the conventional method would have been to construct a reinforced concrete retaining wall and fill the site up to the road level before construction of the house would begin. A large part of the budget would have been burned through on both of these items. The second unique element was the Gothic style roof structure. Traditional roof structures such as curved timber trusses carrying tile or slate would also have proved to be very labour intensive. Drawing on our extensive experience in the commercial and industrial construction sectors we proposed that a steel superstructure sitting on concrete pads, which would carry the precast concrete ground floor, form the roof structure and also deliver the open plan living space would be the best method of building. 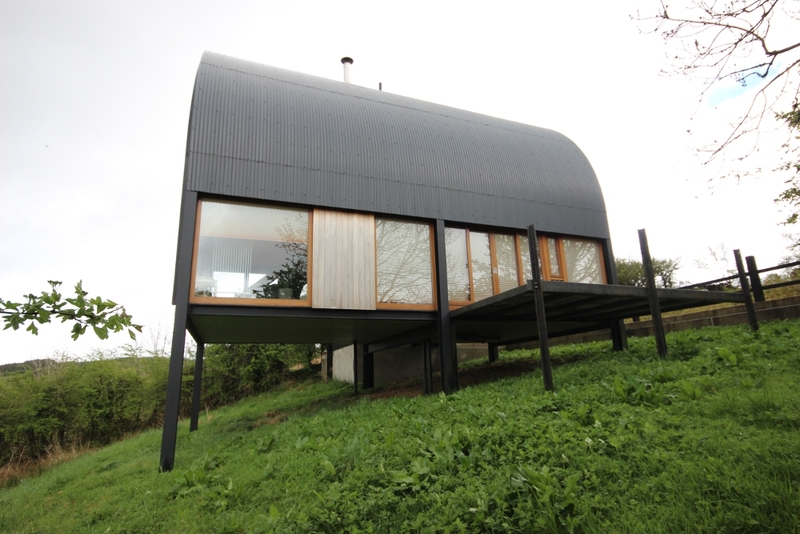 An added benefit of the steel frame system was that the house could be completed a month faster than the conventional method. All we had to do now was to find a company that could supply the three curved portal frames that were the critical parts of the structure. Having worked on many commercial projects we were aware of the benefits of using steel, and following a conversation with Noel Clarke our structural steel contractor he informed us that we would have to source the portal frames in the UK. Upon receiving the costs of the portal frames, which were considerably lower than expected it was agreed that the project could go ahead. 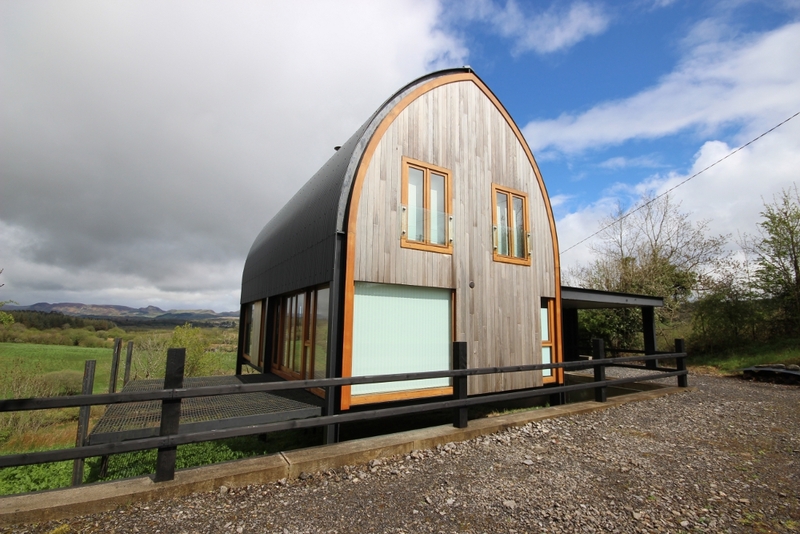 Energy efficient hardwood windows, hardwood exterior cladding and curved profile roof cladding from Tegral made up the remaining parts of the external fabric of the building. 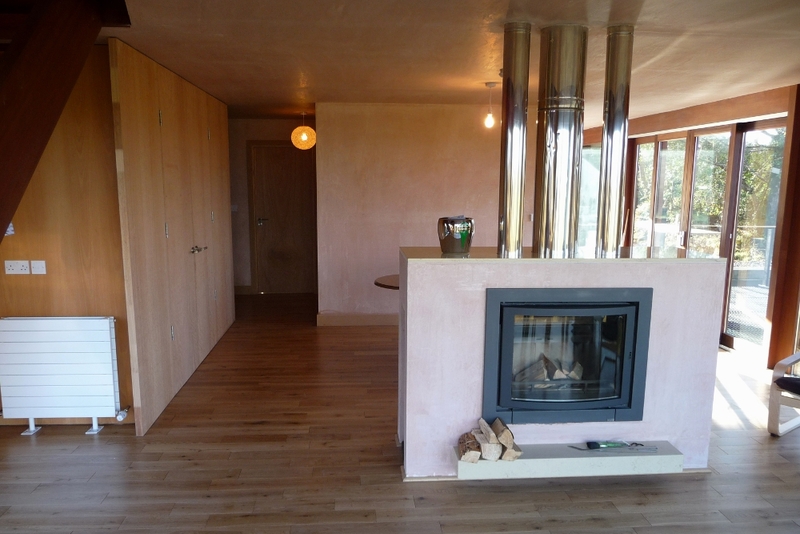 High levels of Rockwool insulation in the walls, roof and floor plus a wood burning stove would ensure that this would be a very energy efficient house. The work started in early December and was completed in late May a total of twenty five weeks which was pretty good as the bulk of the work was carried out during the winter. 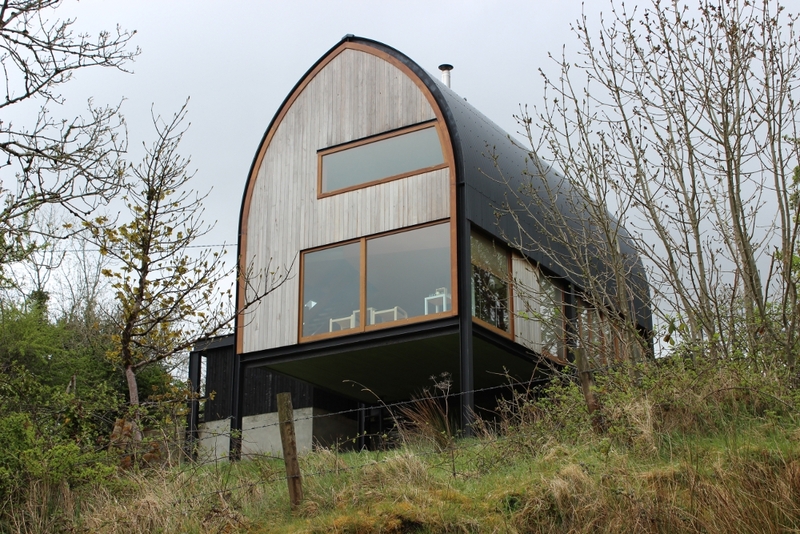 The pressure for new homes in rural Ireland led to a proliferation of uninspired bungalows. 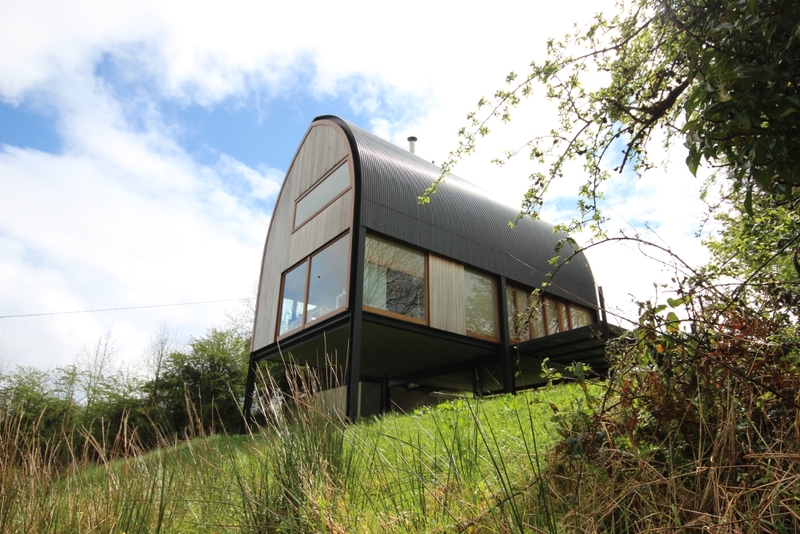 This project in County Leitrim shows how a new house can combine vernacular and modern design in harmony with its woodland setting. When a client contacts a builder they should present an energy rating for the structure they plan on building. 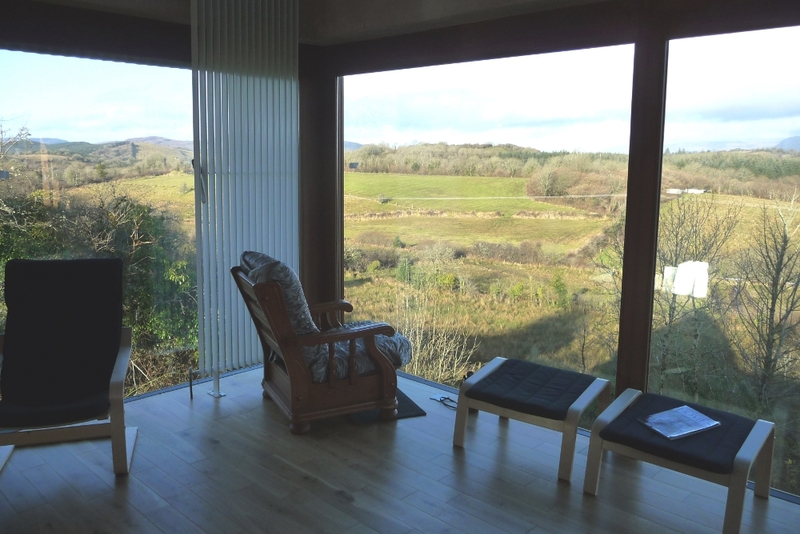 Often people will have features and room sizes in mind but there is also a lot more to think about if you want a building that is functional, beautiful and cost effective to inhabit.